Another good option for lunch is a large salad of some kind – based on vegetables, and including meat, legumes or grains. In this lesson, we’re going to make a variety of salads, and then finish with lunches by looking at some OK bought options. Non-starchy vegetables – low in carbs and can be eaten freely. Some nutrition experts recommend eating 4 cups of these a day. These can be eaten in salads, fermented (covered in lesson 11), or steamed. Starchy vegetables – Including root vegetables. Mostly need to be cooked before eating. Eat small amounts of these (or grains or legumes) to round off a meal. Fruits – These really don’t belong in the same category as vegetables at all. Although they do have valuable nutrients, they are mostly also high in sugar. So limit to a couple of small serves a day, maybe one with breakfast, and one after dinner as a dessert. You will most likely have heard that it’s beneficial to eat lots of raw vegetables, as they are full of enzymes. While it’s true about the enzymes, the Chinese Traditional Medicine viewpoint is that raw, cold vegetables are hard to digest, especially in the winter. A Nourishing Traditions viewpoint is that different vegetables are best prepared in different ways. That is, some are most nutritious eaten raw, some are better cooked and many are better if fermented. In this course, we’re looking at different ways of preparation. We’ve already looked at soups, and in this lesson, we’re going to look at vegetables that are good eaten raw, and thus suitable for salads. Later on, we’ll look at cooked vegetables, and sprouted and fermented vegetables. My view is, get some variety. 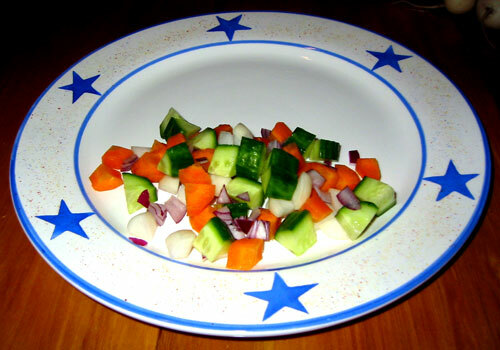 In the summer, it’s nice to have a salad at lunchtime and some cooked vegetables at night. In the winter, salads lose their appeal, so have soups and stews instead. But at a meal when you’re eating no raw foods, add some fermented foods for beneficial acids and enzymes. Another thing to remember is that you need fat with a meal to help digest your vegetables and assimilate their nutrients. So we’ll be using dressings with fats, and also adding some high fat foods to our salads. (Although we’re going to cover sauces and dressings in a later lesson, we’ll start this lesson by making two basic salad dressings.) We can make salads more easily digestible by finely chopping, shredding or grating the vegetables to start the process of breaking the food down. Where we’re adding legumes or grains to our salads, we’ll be soaking them before cooking to neutralise the anti-nutrients. Remember that different metabolic types will need different types of salad – eg. quinoa salad is better for a Carbo type and Bean salad would most suit a Mixed or Protein type. Salads or soups will probably be a better option than sandwiches, if you can find them. Kebab shops seem to be springing up everywhere. Buy a kebab and eat the filling, but leave the bread. Sushi, if freshly made. White rice is not usually acceptable, but if you are really stuck, this might be better than your other options.